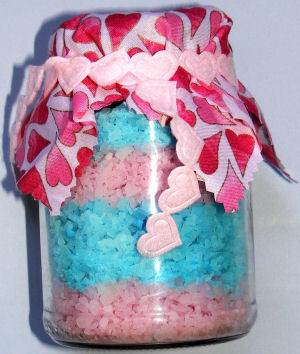 These bath salts are a fun crafty gift which kids can make to give to mother on Mother's Day, a grandmother on Grandparents' Day or other favorite adult any time of year! Put some of the plain bath salts into an old bowl. Put in a tiny amount of essential oil (about 2 drops for every cup of salts) and a tiny amount of food colouring. Stir well with an old wooden spoon until all of the salts absorb the colour. Repeat with as many different colours as you like. Carefully pour the salts into a clean jar (we layered different colours). Cut a square of fabric to fit over the lid of the jar, tie in place with some pretty ribbon. We've tried an unusual technique for this plate which made the design rather exciting! Of course you could adapt this for all sorts of events and use different shapes and pictures. A butterfly would look pretty! Remember, this plate is FOR DISPLAY only.